The first shop you'll activate is the Juice Bar. Grandpa will give you some Tomato seeds that will mature instantly so you have ingredients to open the shop. When customers enter the Juice Bar, the will ask for a juice made with the crops you are growing on your farm. If you only have one crop, then they'll only ask for one type of juice. A variety of crops growing on your farm will result in customers asking for juice blends as well as one ingredient juices. The customer will ask for a juice made with a specific crop, a texture, and style of ice. The first thing you need to do is pick the ingredients the customer asked for. If the person asked for two different types, you can select how many of each you would like to do. For example, if someone asked for Carrot and Tomato, you could pick 1 Carrot and 4 Tomatoes or 3 Carrots and 2 Tomatoes, and so on. You will always have to select five ingredients. The available ingredients will roll by on carts. Your task is to point your Wii remote at the crop you want and shoot it off the cart by pressing A. Among the normal crops will be steel-enforced crops. You do not want to shoot a crop covered in metal, else all of the crops you had picked will be dumped and you'll have to shoot the 5 crops all over again. To score the max 800 points possible, you need to shoot the five crops very quickly; within 10 seconds or so. Unfortunately the more crops you grow on your farm, the longer it takes for each one to appear on the conveyer belt carts. The game will put out the normal and the metal covered crops for each one you have growing on your farm. If you are growing crops in all five available crop fields, then you have 10 different crops you have to wade through in order to find the specific one your customer asked for. This takes a long time and will upset your customer. If you want to get the 800 bonus for this game, try to only grow 3 different types of crops on your field. The fewer plants you are growing, the fewer choices you have to wait for during this mini game. You can buy the Produce Slicer from the Tool Shop for 1000 G. You can then cut your ingredients into smaller pieces and possibly earn another 800 points. 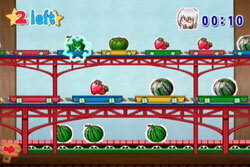 The ingredients you picked in the shooting gallery game will be loaded into a tube and shot into the air. 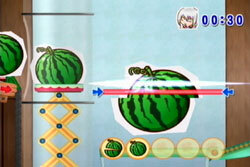 When they fall, swing your Wii remote to cut the ingredient as it passes by the cut line. The smaller the ingredient, the harder it is to cut. If you miss one ingredient you will receive 700 points. Missing two will drop your score down to 300. If you miss 3 ingredients then you will only receive 200 points, and only 1 successful cut will give you 100 points. Your customer will tell you at the beginning what texture he/she wants the juice to be. In case you forget what the request was, the Blender has a blue arrow pointing to the texture he or she requested; Chunky, Blended, or Pureed. 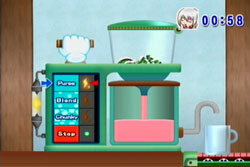 To pump the handle on the blender, turn your Wii remote horizontally and then move it up and down. Raise your red-arrow gauge to match where the blue arrow is pointing, and then move your Wii remote up and down at a steady pace to keep the red arrow in the texture area. If you don't get your red arrow in the right spot before the blender starts to mix, you won't get the 800 points! If you move out of the texture frequently (i.e., you keep dropping to Chunky when making a Blended juice), then you also will loose your points. It is either you get the full 800 points or you get nothing. This is another add on you have to buy from the Tool Shop. The Ice Maker costs 2000 G.
This game is rather easy. You will be presented with three types of ice, and you simply have to pick the correct one. If you can't remember what your customer asked for, either Crushed, Normal, or Large, the correct ice to pick will flash in green before dropping into the cup. When all of the ice are in their cups, the cups will rotate around. 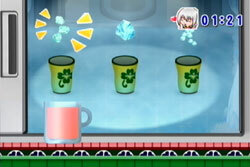 Keep an eye on which cup has the ice you want, and then select it when the cups stop moving. That's all you have to do. If you select the wrong ice, then you won't earn the 800 points. This is only available if you buy the Juice Set add-on package. This isn't a new mini game, but instead a bonus 800 points if you are growing Watermelon on your farm and a juice customer asks for a juice made with Watermelon. Even if the person asks for multiple ingredients as well as Watermelon, you'll get the bonus.